Late this afternoon (2250 UTC), I logged a second station on the previously dead-to-me* 1070 kHz courtesy of the new C.Crane Skywave receiver (again barefoot using its internal antenna). The new logging was WKOK in Sunbury, Pennsylvania, transmitting sports talk with 10 kW 208 miles to my west-southwest with an S-1 to S-3 signal. Sister Gigi gifted me with a C.Crane CC Skywave receiver for Christmas. As the holiday festivities wound down Christmas evening, I had an opportunity to slip a pair of AA batteries into the Skywave to see how it works. Whenever I try out a new radio, I have two frequencies I tune to first to give the radio a quick check-out: 92.1 Mc and 1070 kc. My favorite FM radio station, WLNG, transmits on 92.1 Mc, 55 miles away on the North Shore of Long Island. Every portable radio I own requires that I fully extend its telescoping antenna and position the antenna just so in order to receive WLNG. When I tuned the CC Skywave to 92.1, I could hear WLNG clearly when I touched its antenna. 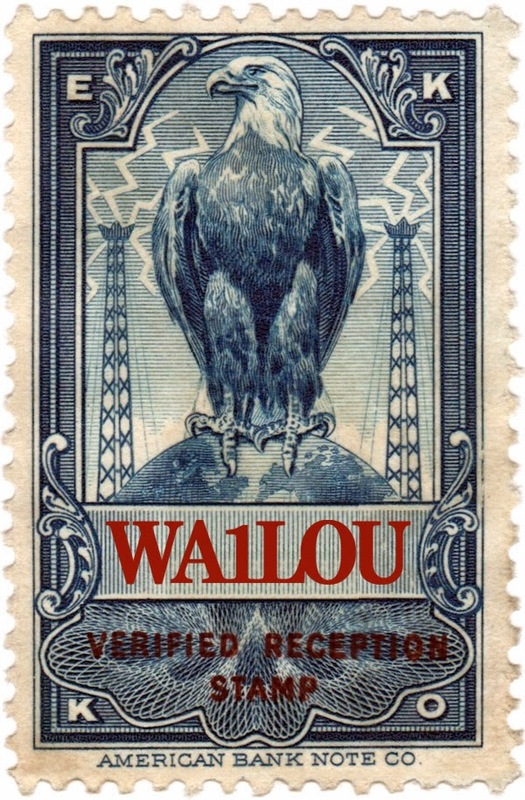 By removing the antenna from its cradled horizontal position and positioning it vertically without extending it one iota, WLNG's signal was solid and stereophonic. I was impressed. 1070 is a dead frequency for me. The 50,000 Watt blowtorch known as WTIC is 12 miles away on the opposite side of the valley transmitting on 1080 kc. Every portable receiver I own only hears WTIC's backwash on 1070, but not 1090 (go figure), and as a result, my AM radio log has no entry for 1070. Tuning the CC Skywave to 1070, I did not hear any sign of WTIC, but I could hear the weak signal of a station playing Christmas tunes. 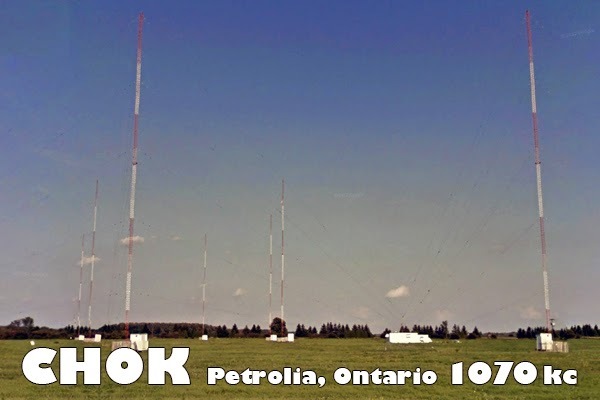 Repositioning the radio, I peaked the signal to an S-3 level and at 0437 UTC, I heard the station identification: CHOK in Sarnia, Ontario, transmitting 10 kW from Petrokia, Ontario, 488 miles to my north-northwest. Wow ‑ I was very impressed! A brand new station in the log on a frequency that was previously unusable using the radio's stock internal antenna! This fall, AT&T got out of Dodge and Frontier Communications took over as our landline and Internet provider. Frontier screwed up our billing and their Internet service is the worst. Getting e-mail is like playing Russian roulette. Frontier's system frequently fails to recognize my password when my e-mail app tries to retrieve new messages. I have found no fix for this problem and just have to keep trying to get my e-mail until Frontier's system finally recognizes my password. Browsing websites is even worse. Occasionally, accessing a website reminds me of the good old days with AT&T, but most of the time, trying to access a website is like trying to pull teeth. Websites load so slowly that my browser often gives up and sends me an error message saying that Frontier's system can't access the website I am trying to hit. Sometimes, rebooting the computer speeds things up, but that only works about half the time. But why do I have to resort to that fix? I never had to do that with AT&T. I would drop Frontier Communications like a hot potato, but I dread having to deal with changing my e-mail addresses! North Pole, Alaska 99705, 1170 on the radio dial. I have been listening regularly, but hearing nothing new on the AM band. So when life gives you lemons, make lemonade. 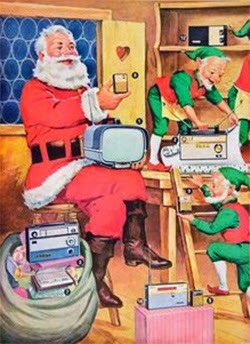 Home for the holidays, I plan to do some reconfiguration of the radio shack equipment, as well as some shack housecleaning. 12-13-14 is today's was yesterday's date. We won't see that happen again for awhile! I monitored 820 kHz between 2230 and 2345 UTC last evening and all I heard was the previously logged WNYC out of NYC (actually transmitting from Kearney, NJ, 85 miles southwest of here). There was not a peep from any other stations on 820 last evening as compared to the three or four I heard the previous evening. Last evening, I parked my receivers on 820 kHz because there were three or four stations vying for dominance of the frequency. I managed to identify two of the stations ― both new loggings here in Downtown Wolcott. “Gamut Radio,” WWFD in Frederick, Maryland, 283 miles to my southwest was prepping to broadcast the Washington Capitals hockey game and was the dominant station on 820 transmitting 430 W, which resulted as an S-1 to S-3 signal in my neck of the woods at 2347 UTC. “The Answer,” WNTW in Chester, Virginia, broke through WWFD at 2349 UTC transmitting 1 kW 379 miles to my south-southwest. Its signal peaked at S-1 at 2349 UTC just as it broadcasted its station identification. I used a C.Crane CCRadio SW receiver with an C.Crane CC twin coil ferrite external antenna to log WWFD and a C.Crane CCRadio 2E Enhanced receiver with a Terk Advantage antenna to log WNTW. I plan to revisit 820 kHz tonight and try to pick off some more stations from that busy frequency. After months of family health issues, the dust is finally settling and I can hunker down next to the radios to hear what I can hear. In the past few days, I made two new entries into the log. WMEX is a new call sign for a previous entry (WWZN). Transmitting 50 kW from Boston (104 miles to my north-northeast), it had a solid S-5 signal here on 1510 kc on December 1 at 2345 GMT. WAIK is a real brand new one for the log. Transmitting a mere 55 W from Galesburg, Illinois, 902 mile to my west, their signal on 1590 kc wavered between S-0 and S-2, but I heard their station identification at the top of the hour on December 9 at 0000 GMT. Both loggings were made using my C.Crane CCRadio 2E Enhanced receiver and Terk Advantage antenna. By the way, rumor has it that I will be gifted with a radio on December 25: the brand new C.Crane CC Skywave AM, FM, Shortwave, Weather and Aviation Band receiver. If the rumor is true, you can expect my review of the radio here in the near future. 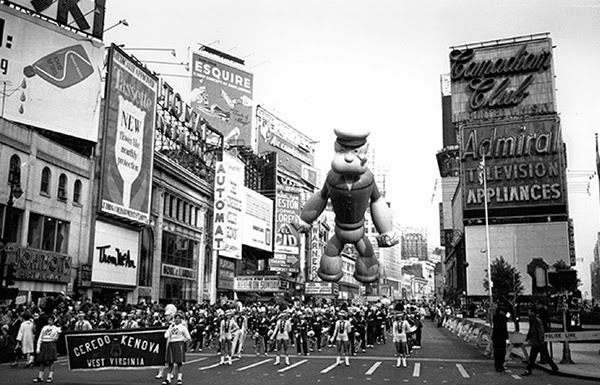 I used to enjoy watching the New York City Thanksgiving Day parade — the bands, the floats, and especially the big balloons. I would be glued to the television set from the beginning to end, but not anymore. It has been a long while since I enjoyed watching the parade on TV. Today, the telecast is not coverage of a parade. Rather, it is a blatant wall-to-wall advertisement for the current musicals playing on Broadway or the latest boy or girl band that Disney is trying to promote. I actually saw the parade in person a few years ago and enjoyed it immensely. Too bad I can't enjoy it on television any longer. Good news is that I am OK.
Bad news is that there have been a couple of health issues in my immediate family that have required a lot of my attention taking me away from my radios and the blog. Good news is that there is light at the end of the tunnel. The health issues are finally getting resolved and I will have some free time for my radios and the blog. So stay tuned! Heard a preacher on 1040 kc last night at 2305 UTC and it turned out to be a new station for the AM log: WCHR in Flemington, New Jersey, transmitting 1500 watts 131 miles to my southwest putting an S0 to S3 signal into my CC Radio 2E and Terk Advantage external antenna. Also heard a Spanish language station on 1050 kc that I failed to identify. I was pretty sure that it was not WEPN which I already have in the log. Other possibilities were WBQH and WVXX, but what I heard on the air did not match what those stations were streaming on the Internet. I will listen for it again tonight. I go to the Hamvention in Dayton every year, so it was cool to log a Dayton AM radio station last evening at 2247 UTC: WONE transmitting 5 kW on 980 kc, 656 miles to my west southwest. Signal was S0 to S2 into the CC Radio 2E and Terk Advantage external antenna. WONE’s transmitter is located in Woodbourne, a suburb south of Dayton, just about one mile from the banquet hall where I attend the TAPR-AMSAT annual banquet each year during Hamvention. At 2300 UTC, I heard WVBF on 1530 kHz transmitting 2 watts 106 miles east-northeast from Middleborough Center, Massachusetts. Signal was S0 to S2 into the CCRadio-SW and CC twin coil ferrite external antenna. At 0200 UTC, I heard CFMJ on 640 kHz transmitting 50,000 watts 348 miles west-northwest from Lincoln, Ontario. Signal was S0 to S1 into the CC Radio 2E and Terk Advantage external antenna. I only logged seven new AM and FM stations during July and August. VHF conditions were usually excellent during the daylight hours of the past two months as indicated by http://aprs.mountainlake.k12.mn.us/ However, I was usually sitting at my desk at work during those times drooling over what the propagation map was displaying, but unable to take advantage of the situation. Casually tuning the C.Crane CC Radio 2E Enhanced on Labor Day evening, I did add a new FM station to the log, WILI on 98.3 MHz transmitting 1,050 watts 39 miles to my east in Willimantic, Connecticut. WDAQ, 31 miles to my west southwest usually occupies 98.3 from my location, but conditions were such that WDAQ was a no-show and WILI was an S-3. This cover, which I won in an eBay auction is very interesting to me for a number of reasons. The cover has a "fancy cancel." 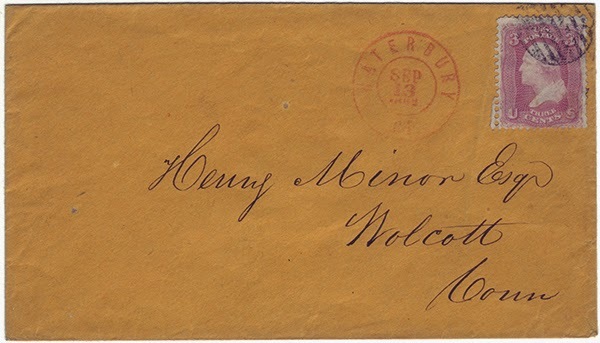 "A fancy cancel is a postal cancellation that includes an artistic design. Although the term may be used of modern machine cancellations that include artwork, it primarily refers to the designs carved in cork and used in 19th century post offices of the United States. "When postage stamps were introduced in the US in 1847, postmasters were required to deface them to prevent reuse, but it was left up to them to decide exactly how to do this, and not infrequently clerks would use whatever was at hand, including pens and 'PAID' handstamps left over from the pre-stamp era. "A number of offices began to use cork bottle stoppers dipped in ink. These worked well, but would tend to blot out the entire stamp making it difficult to check the denomination, and so clerks began to carve a groove across the middle of the cork, making two semicircles. Further enhancements included two grooves cut crosswise (the four-piece 'country pie'), and then two more, for the eight-segment "city pie", and notches cut out of the outer edge to lighten the cancel further. "The carving process seems to have sparked the creativity of clerks across the country, and soon thousands of designs appeared, ranging from shields to skulls to stars, geometrical shapes, animals, plants, and devils with pitchforks. Among the most common fancy cancel designs are stars and crosses of varying designs. The Waterbury, Connecticut post office was the master of the practice, and turned out new cancels for every holiday and special occasion. Their 'Waterbury Running Chicken' cancel, perhaps a turkey since it appeared close to Thanksgiving of 1869, was in use for only a few days and is now the most prized of all 19th century cancels, with covers fetching very high prices. 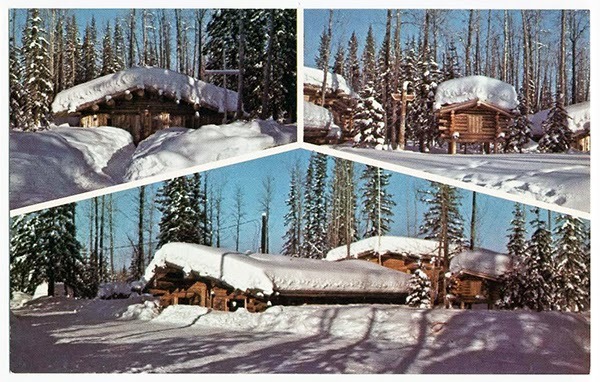 For a webpage full of Waterbury fancy cancels, see http://www.theswedishtiger.com/1861water.html. The 2014 installment of the ARRL/TAPR DCC is only three weeks away, on Friday, September 5th through Sunday, September 7th at the Austin Marriott South in Austin, Texas. The DCC has two days of technical forums on Friday and Saturday and a concurrent introductory forum on Saturday. On Saturday night, the banquet will feature an interesting speaker and the Sunday morning seminar is "Introduction to SoC FPGA Programming for Mixed Signal Systems" by Chris Testa, KD2BMH. There will be free tables in the demo room to demonstrate projects and vendors to demonstrate products. Time is running out, so those interested in attending should register for the DCC and make hotel reservations ASAP. More DCC information is available on TAPR’s website. Last night, 145.39 MHz was wide open according to this, so I cranked up the FM broadcast band radio to see what I could hear and I logged three new stations! WFCC (love that call sign!) playing classical music on 107.5 MHz, put in an S0 to S1 here with its powerhouse 50 kW transmitting from Chatham on Cape Cod, 152 miles east. WFHN on 107.1 MHz was S1 transmitting 5,400 watts from Fairhaven, Massachusetts, 105 miles east. WDBY, "Kicks 1055" on 105.5 MHz with a country and western format was S0 to S1 with a mere 900 watts from Patterson, New York, 37 miles west southwest. Radio equipment here was my C.Crane CC Radio 2E Enhanced and its stock whip antenna. 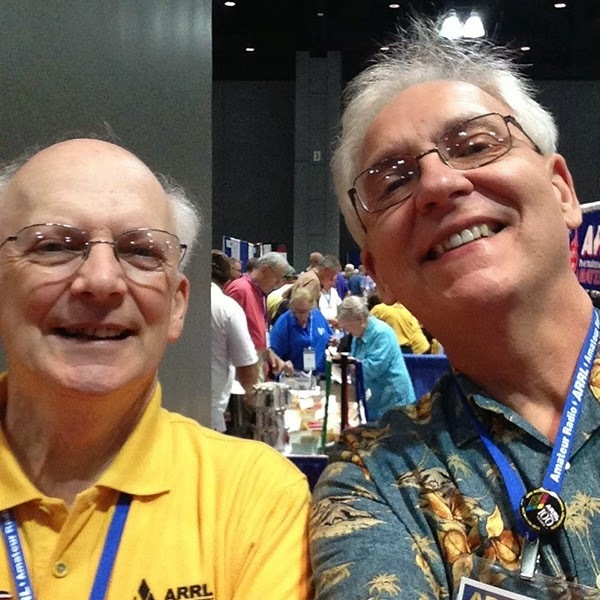 Speaking of VHF DX, the photo above is I and another long-time VHF DXer, Dave Sumner, K1ZZ, at the ARRL Centennial Convention in Hartford last month. Besides chasing Es, Dave runs the show up at 225 Main Street in Newington. According to the APRS propagation server, 2 meters was wide open last night, so I perused the FM broadcast band for awhile and caught one new one: WAAF on 107.3 MHz transmitting 9.6 kW from Westborough, Massachusetts, 80 mile to the northeast. WAAF’s signal was a puny S-1 on the CC Radio 2E and its stock whip antenna. VHF propagation has been excellent almost everyday this month so far, but I did not work any new stations for over two weeks until today. At 1643Z, WKLV put in an S-2 signal on 96.7 MHz transmitting 3.1 kW from New Rochelle, NY, 65 miles to the southwest. K-Love is a Christian religious station. At 1650Z, WNYZ had an S-3 signal on 87.7 MHz. I believe this is a pirate station transmitting in Russian (“Dura Radio”) from (maybe) Brooklyn, NY, 85 miles southwest. Both stations were the first loggings for their respective channels and were monitored on the stock radio of my 2007 Subaru Outback Sport. By the way, I will be staffing the TAPR booth at the ARRL Centennial Convention in Hartford this Friday and Saturday, so stop by and say, "Hello!" My first encounter with Mad magazine was in my uncle's dorm at UCONN where I saw a copy of the fly swatter cover (number 57, September 1960) lying on his desk. Although I was only 9 years old, I recognized the brilliant satire behind that cover and soon I began spending my allowance (25¢ Cheap) on the output from the usual gang of idiots. I never missed an issue and expanded my madness to include everything that Mad had to offer... not just printed matter, but also Mad trash like their bust of Alfred E. Neuman. I amassed quite a collection, but there was a gap... issues 1 to 61, that is, those issues published before I started buying the mag. Issues 1 to 23 were the comic-book-formatted Mads and were very expensive. But publisher Russ Cochrane saved the day when he reprinted the comic books in oversized hard cover format – so who needed expensive old yellowed dog-eared comic books, when I could have Mr. Cochrane's beautiful pristine reprints? That narrowed the gap in my collection to issues 24 to 61. The higher end of the gap was affordable and I picked up those issues from various sources for a few bucks apiece. But the low end of the gap was much less affordable and I resigned myself to living with a permanent gap just like Alfred E's dental work. Those 21 issues were numbers 24 to 44 in fine to very fine condition. Number 24 (the first magazine-formatted Mad) in very fine condition alone goes for over $750, so this was a very fine deal. After that, I filled in the rest of the gap very quickly. Caught another new one to fill an empty channel in my FM log: 104.5 MHz with W283BS transmitting 250 watts from Bridgeport, Connecticut, 29 miles to my southwest putting an S1 signal into the stock radio of my 2007 Subaru Outback Sport. W283BS is a translator station for WMRQ on 104.1 MHz. Last post, I mentioned hearing two stations on 107.1 MHz that I could not identify. Checking the channel today, I found only one station and it identified as WJMJ. I already have WJMJ in the log, but on a different channel (88.9 MHz), so what was I hearing on 107.1? After a little research, I discovered that WJMJ has a translator station on 107.1 with the call sign W296AO. Playing 1960s oldies, it transmits 3 watts from the top of the Knights of Columbus Building in New Haven, 15 miles to my south-southwest, putting an S1 signal into the stock radio of my 2007 Subaru Outback Sport. Enhanced VHF propagation was in the ether most of the day and I logged two new ones on channels that were blank in my FM log until yesterday. WBLI at 1616 UTC transmitting 49 kW on 106.1 MHz 47 miles to my south-southwest in Patchogue, Long Island, New York. WBLI’s signal was an S-4 into the stock radio if my 2007 Subaru Outback Sport. And from the top of the Empire State Building, 80 miles to my southwest came WLTW at 1623 UTC with an S-6 signal transmitting 6 kW on 106.7 MHz. I also heard two stations on 107.1 MHz, but was unable to identify them. Here is a French advertisement for the Radiofrigo. WTCC at 2251 UTC with an S-6 signal on 90.7 MHz transmitting 4 kW from Springfield, Massachusetts, 37 miles north-northeast. WORC at 2300 UTC with an S-1 signal on 98.9 MHz transmitting 1,870 watts from Webster, Massachusetts, 56 miles east-northeast. Equipment used was a C.Crane CC Radio 2E enhanced with its stock whip antenna. According to the VHF Propagation Map, propagation was good in my neck of the woods before I ventured out to my car to find some FM band DX. WKTU on 103.5 MHz with an S-3 signal running 17 kW out of Lake Success, Long Island, NY. 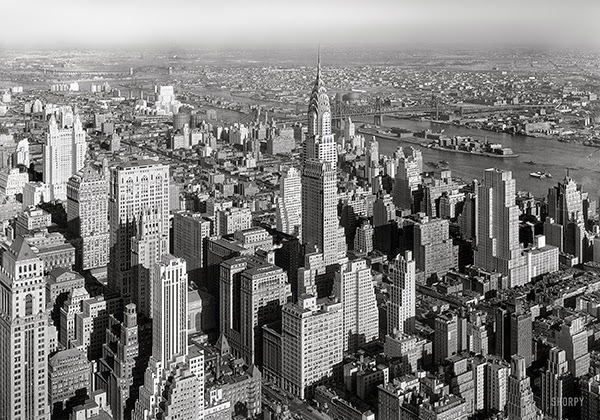 The WKTU transmitter is actually located at the top of the Empire State Building in Manhattan, 81 miles southwest. Then I tuned to other channels that were not in my log and found an S-1 signal on 101.9 MHz. The signal level was up and down. It disappeared completely a few times and it also became very strong - an S-7 signal - at one time. Turned out to be another new one: WCIB transmitting 50 kW from Falmouth, Massachusetts on Cape Cod, 110 miles east. Equipment used was the stock radio and antenna of my 2007 Subaru Outback Sport (radio pictured above). And by the way, this DX session occurred during a heavy rainstorm with thunder rumbling in the distance. Last night, I warmed up the CC Radio 2E Enhanced and tuned to 102.3 MHz to see if I could identify the classic rock station vying with WBAB for dominance of that channel. And at 2229 UTC, it identified as WMOS with an S-1 signal from Stonington, Connecticut, transmitting 3 kW 49 miles to my east-southeast. Next, I checked all the channels that are empty in my log and found an S-2 signal on 99.7 broadcasting political nonsense talk. At 2239 UTC, it identified itself as WPRO in Providence, Rhode Island, running 39 kW 77 miles to my east-northeast. Nothing new on 90.1 MHz today, so I tuned slowly up the band parking my receiver on any channel not yet represented in my log. At 1642Z, 100.7 MHz brought me WHUD transmitting 50 kW from Peekskill, New York, 58 miles to my west-southwest. It was a constant S-2 signal. 102.3 MHz was busy with two stations vying for my attention. At 1655Z, the station id for WBAB won the battle. 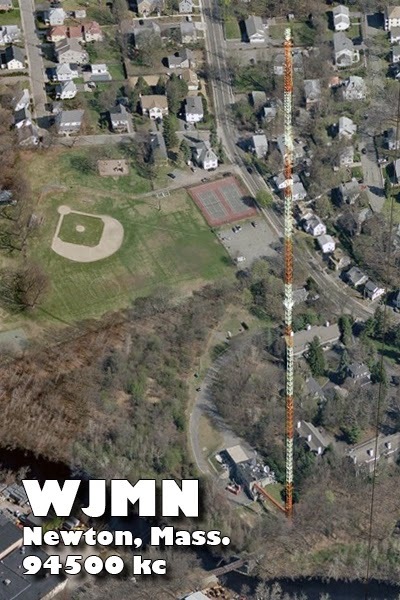 Located in Dix Hills on Long Island, 55 miles to my south-southwest, WBAB was transmitting 6 kW. It’s signal was S-2, but at times, another station overtook it, but I could not positively identify it. So I will revisit 102.3 again real soon now. Deja vu yesterday: during my lunch hour, I tuned the stock radio in my 2007 Subaru Outback Sport to 90.1 MHz and added a new station to my log: classical music station WRXC in Seymour, Connecticut, running 45 Watts 19 miles to my west-southwest. Like yesterday’s catch on 90.1, WRXC’s signal was not overwhelming, but there was no sign of the station (WUSB) I heard yesterday at the same time, same channel. Needless to say, I will try 90.1 again tomorrow. Since returning from the Hamvention last month, I had not done much AM or FM broadcast band DXing. However, with the increased possibility of enhanced VHF conditions this time of year, I was motivated to start anew tuning around the FM band and I caught a new one today (my 80th FM station) at 1655 UTC: WUSB running 3.6 kW on 90.1 MHz out of Stony Brook, Long Island, New York. Located 46 miles to my south-southwest, the State University of New York radio station registered an S-3 on the virtual S-meter of the stock AM-FM radio in my 2007 Subaru Outback Sport. The 2014 installment of the Hamvention was a memorable one. I have been attending Hamvention regularly since 1978 and this year, we had some of the worst weather I have ever seen at Hamvention... even worse than when the event was held a month earlier when the potential for lousy weather was higher. It rained, sleeted and hailed on Thursday, Friday and Saturday. Morning temps during those days started in the high 30's and did not get much above 50. I knew precipitation was in the forecast, but I did not expect it to be so cold and I did not dress appropriately. Luckily, I had a hoody to keep me warm when needed. My family likes to watch my progress to and from Dayton via APRS, but I do not have a ham radio installed in my vehicle, so APRS was not an option. However, I do have an iPhone and there are some APRS apps for it. So I bought an app called OpenAPRS and it filled the bill as can be seen by my tracks as displayed on aprs.fi above. As I wrote in my previous blog post, "I always staff the TAPR booths on Hamvention Fridays and Saturdays, so if you make it to Hamvention this year, stop by... and say “Hi.” Well, at least one of you did just that: Dave = WA1OUI, who has been one of my most loyal readers and is also a long-time friend going back to the FM repeater wars of the 1970s. Dave was working in one of the ARRL booths just up the aisle and I returned the favor and stopped by his booth! I ran into a lot of other old friends during the weekend --- not sure if they read this blog or not. Some showed up at the TAPR booth and some I bumped into on the convention floor; folks like Al = N8DHF, Bob = WB4APR, Craig = K1QX, Dave = K1ZZ, Guy = KC5GOI, Harold = WJ1B, Joe = K0NEB, Rich = W2VU, Steve = N8GNJ, Tom = K3IO and many others. The TAPR booth was very busy all weekend, busier than its been at recent Hamventions probably because we had a lot to show this year. John = N8UR was showing his high precision timing projects, Jeremy = NH6Z and Scotty = WA2DFI were demonstrating SDR, Mike = No-Call-Yet had his HackRF attracting a lot of attention, Chris = KD2BMH was with his WhiteBox SDR handheld transceiver, and there was a big crew staffing the digital voice demo. I fielded packet radio and APRS questions and filled in at the cash register and elsewhere while others took breaks. Touring the Hamvention floor on Saturday, I stopped by the booth of the Society of Amateur Radio Astronomers. Since I dabble in both radio and astronomy, I thought that the booth would have something that interested me and I walked away with a radio telescope kit to receive signals from Jupiter, the Sun and the galactic plane. I will have more to say about this after I build the kit and get it on the air. I hate the drive to and from Dayton, but I am already looking forward to doing it again next year! 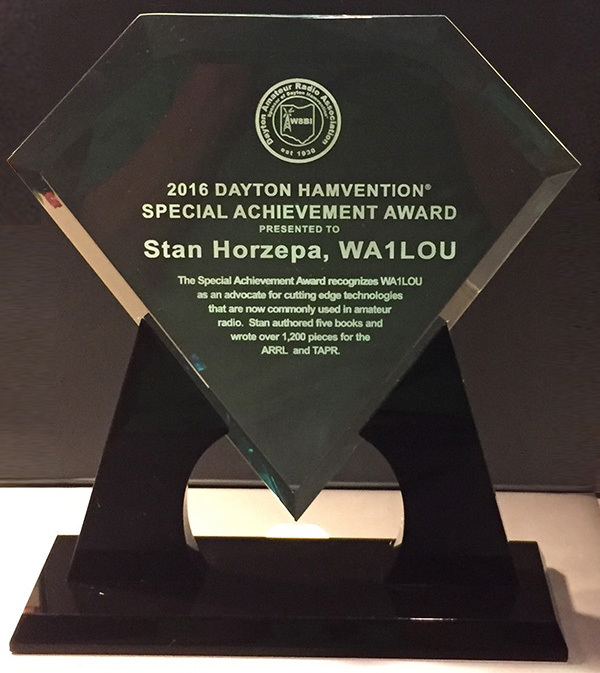 As I mentioned here last month, I will attend Hamvention in Dayton, Ohio, this weekend. This has become an almost annual trip ever since my former boss at ARRL headquarters, Ellen White, W1YL, pushed me out the door at 225 Main Street to attend my first Hamvention in 1978. I estimate that I have attended about 30 Hamventions in the ensuing 36 years (I should have kept a log), which is kind of impressive since it is not a local event. Rather, it entails traveling about 750 miles west over some of the most boring Interstates (I won’t mention numbers) this side of the Mississippi River. If you subscribe to the online edition of CQ, be sure to check out the article by Joe Eisenberg, K0NEB, in the CQ Plus portion of the May issue (CQ Plus only appears in the online edition). In “The Blue Yonder is Wild, Indeed, When DXing the FM Broadcast Band,” Joe discusses listening to FM and AM broadcast stations while flying in a commercial jet airliner. This is something I have always wanted to do, but have not had the opportunity to do because I seldom travel by air. Joe’s article is a good read; it answered questions and confirmed a lot of thoughts I had on the subject. The mystery station that I monitored Tuesday evening on 94.5 MHz was a little stronger Wednesday evening on the C.Crane CC Pocket AM/FM/WX Radio and C.Crane CCRadio 2E Enhanced; strong enough to be able to understand some of the chatter in between songs. Near the top of the hour (2257 UTC), I clearly heard the station identification: WERB, which is located at the Berlin (Connecticut) High School, 10 miles east, transmitting a mere 24 Watts! I also logged WNSH on 94.7 MHz earlier in the day (1647 UTC) on my car radio. The country and western station was transmitting 23.5 kW from Newark, NJ, 90 miles west-southwest. Tuesday evening, I was monitoring 94.5 MHz with my C.Crane CC Pocket AM/FM/WX Radio and I could hear a station way down in the mud. It was playing Rat Pack tunes: a string of Frank Sinatra songs followed by a Dean Martin song. There was very little chatter between songs and the signal was so weak that I could not understand a word of what was being said. I decided to try my other radios. 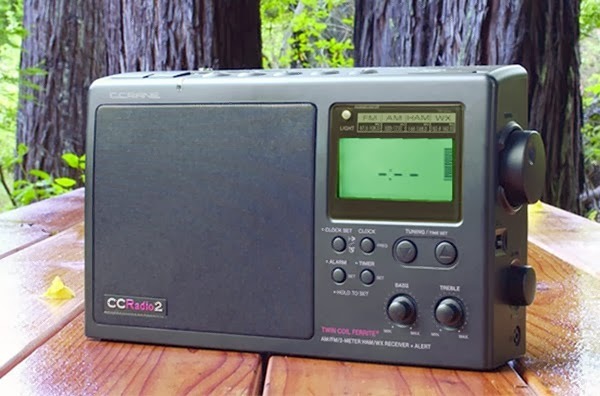 The C.Crane CCRadio-SW detected nothing on 94.5, while the C.Crane CCRadio 2E Enhanced heard the signal at the same muddy level as the C.Crane CC Pocket. I left the 2E tuned to 94.5 while I worked in the shack. Suddenly, a different station came up from out the noise at 2311 UTC and put in a solid S-3 signal for about four minutes: WPST running 50 kW out of Trenton, New Jersey, 140 miles southwest. After WPST faded away, another signal came up from out of the noise at 2322 UTC with an S-2 signal: WJMN running 9.2 kW, 100 miles east-northeast from a 1200-foot tower in Newton, Mass, just southwest of Boston. 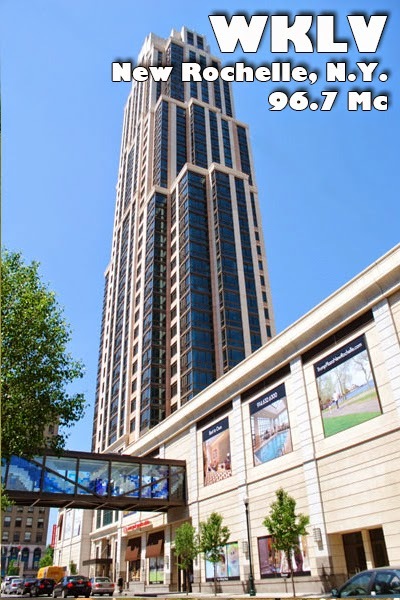 The tower is one of the big four towers in the Newton-Needham area that you cannot miss when traveling in that neck of the woods. After WJMN faded away, the Rat Pack station was still wailing away and then it faded out, too. I will monitor 94.5 again this evening to see if I can pin it down. I have not had many opportunities to DX with the replacement C.Crane CC Pocket AM/FM/WX Radio that C.Crane sent me last week to replace the unit that had a faulty BAND pushbutton. However, I turned the new radio on at the top of the hour Friday evening (0200 UTC Saturday) and heard the station identification for WKAL in Rome, New York. 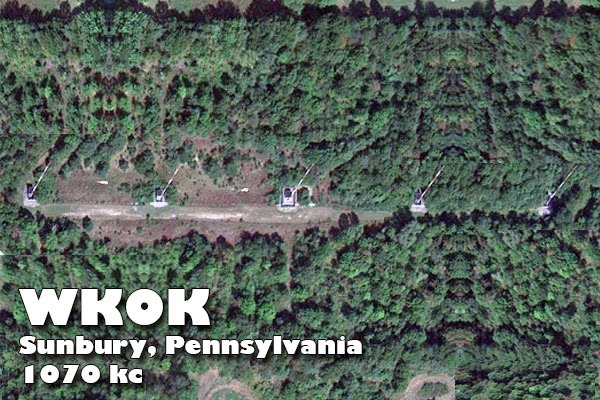 Transmitting 1 kW on 1450 KHz, 169 miles northeast, WKAL is a new station in my AM radio log and was heard using the CC Pocket’s internal antenna. After reading some positive reviews of the C.Crane CC Pocket AM/FM/WX Radio, I decided to add the radio to my collection. I ordered it last Thursday and it arrived in the mail last Saturday afternoon. Saturday evening, I installed batteries in the radio and began using it. Right out of the box, the pushbutton that switches between the AM, FM and weather bands was difficult to use. It required a lot of pressure in order to function. I used the radio for a few hours Saturday evening and the more I used the radio, the more pressure was required to get the band pushbutton to work. Sunday morning, I used the radio for about 15 minutes and the problem persisted, got worse, and then the band pushbutton stopped functioning altogether with the radio tuned to the FM band. I contacted C.Crane and they sent me a replacement radio which arrived yesterday. While I waiting for the replacement, I decided to make lemonade with my lemon and fill up my FM log, which had only 21 stations beforehand. While DXing the FM band, I used the radio’s external FM wire antenna which plugs into the radio’s earphone jack. Between Saturday and Wednesday evening without enhanced propagation, I added 50 new entries into my FM radio log! The top three DX stations were WGBH in Boston (100 miles east-northeast on 89.7 MHz), WWLI in Providence (77 miles east on 105.1 MHz) and WVEI in Westerly, Rhode Island (68 miles east on 103.7 MHz). My loggings included a handful of low-powered stations including 10-watt W227AJ in Northford, Connecticut (19 miles southeast on 93.3 MHz), which was the lowest powered station of the bunch. By the way, out of the box, the band pushbutton on the replacement radio works normally and does not require any more effort to use than the other buttons on the radio. After I give the new radio a full workout, I will write a full review, but so far I am very impressed with its sensitivity and selectivity on the FM band. After a dry spell, I logged a new one at 2300Z Thursday: WMVX transmitting 30 kW on 1570 kHz from Beverly, Massachusetts, putting in an S0 to S3 signal on my C.Crane CCRadio 2E Enhanced receiver and Terk Advantage loop antenna, 126 miles west southwest of WMVX. I have heard this station a few times in the past was unable to identify it due to the combination of a very weak signal and a language barrier (Spanish), but I positively identified it last night for number 230 in my AM radio log. One month from today, I will hit the road and head west to Ohio to attend Hamvention, the biggest ham radio show this side of the Arctic Circle. TAPR/ARRL DCC (Digital Communications Conference) is returning to Texas this year. The DCC has two days of Technical forums on Friday & Saturday and a concurrent Introductory forum on Saturday. On Saturday night, the banquet will feature an interesting speaker and the Sunday morning Seminar will be a deep-dive into a technical topic. Those who submit Technical Papers for inclusion in the annual DCC Proceedings will receive preference for a forum, however, you can propose to present a forum without submitting a technical paper. There will be free tables in the demo room to demonstrate projects and vendors to demonstrate products. Make your hotel reservations early to get the special TAPR hotel rate. Updated DCC information will be available on TAPR’s website. I saw my first groundhog of the year today. The property around my workplace is an old apple orchard and groundhogs have the run of the place during the warm weather, but until today, they were out of sight. Typically, I see my first one during the last week of March, but considering the unusual weather around here this year, the groundhogs probably decided to hibernate for an extra week. I saw only two today, but I expect their friends and family will be up and around in another day or two. I logged WFNY on a very crowded 1440 kHz last evening at 2245Z transmitting 5 kW from Gloversville, New York (121 miles north-northwest). Most of the time, WFNY’s signal was an S0 to S1, but it perked up to an S4 when I logged it using my C.Crane CCRadio 2E Enhanced receiver and Terk Advantage loop antenna. Friday evening at 2235Z, I added WGCH to the log. 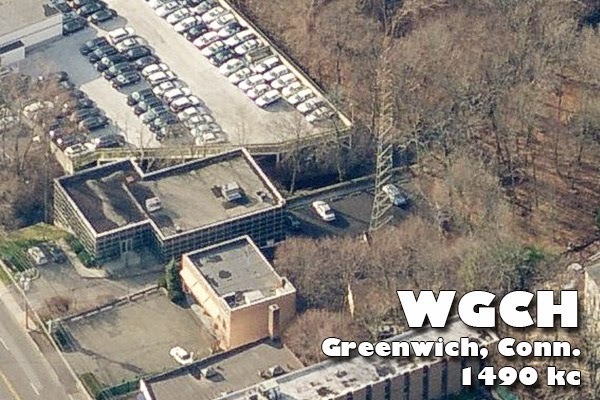 Transmitting on 1490 kHz with 1 kW from Greenwich, Connecticut, 55 miles southwest, WGCH had an S0 to S1 signal as heard by my C.Crane CCRadio 2E Enhanced receiver and Terk Advantage loop antenna. Not hearing anything new on 1460 kHz, I slid up to 1470 and nabbed WSAN at 2255Z Thursday evening. WSAN was running 5 kW from Allentown, Pennsylvania, 145 miles west-southwest. It seemed to be simulcasting sister station WAEB (790 kHz) and was a solid S-7 into the C.Crane CCRadio 2E Enhanced receiver and Terk Advantage loop antenna. The WSAN antenna farm is in an unusual location --- in the middle of a shopping mall parking lot! I bet the antenna farm was there first and the mall was built up around it.